Since the Tampa stand-off in 2001, tens of thousands of Australians mobilized and stood up against the abysmal treatment of asylum seekers under the Howard government. Many of them fell within the broad category of "ordinary Australians". Betty Dixon was one of them, but for some reason many people remember her, even in the years after she passed away. 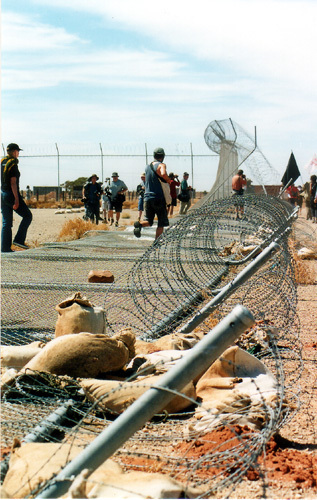 Image: The gates come down during the Woomera Convergence during the Easter weekend in 2002. Betty Dixon was there to bear witness, as she would the next year, at the Baxter detention centre. Betty Dixon was not just a senior Australian, but she was also one of those remarkable people who stood out because of her finely tuned intuitive communication skills and her equally fine friendliness. It's not surprising that reporter Urs Wälterlin, himself a highly credited journalist (he's the Goulburn-based President of the Australian International Correspondents Association) picked up her story for the Süddeutsche Zeitung. Australia incarcerates asylum seekers in detention centers - but people like Betty Dixon are not willing to accept it. - Note: this report was first published in the Süddeutsche Zeitung (no longer available online). Port Augusta is a place in the Australian desert, where breathtaking beauty and pain are going hand in hand. Betty Dixon has been walking between these two extremes for an hour now. The feet of this 73 year old are trying to find a place between the pebbles of the track, with the sun burning on her shoulders. A hat protects her fair skin from the sun. "I'm thirsty", says the frail looking lady. Breathing heavily she sits on a boulder by the side of the road. She picks up her water bottle with the thin bones of her hand, her eyes are sweeping over the endless expanse of the desert. "It is so peaceful here" the old woman remarks "yet, it is also hell". We are near the detention Center for Asylum Seekers at Baxter in the desert of South Australia, about ten kilometers form the town of Port Augusta. 500 demonstrators are spread out over 3 kilometers from their camping area right up to the doors of the most modern detention center built on this continent. The police have closed the area to all vehicles. They are not going to let another break-out happen, where demonstrators may free detainees, as happened at another facility in Woomera. Betty Dixon does not have the face of a typical rebel against the system, a system she describes as "degrading to humans and racist". She grew up in a middle class and conservative environment in a small town near Sydney, trained as a midwife and lived a quiet and orderly life with her late husband, the director of a bank. With her white hair, she is a stark contrast to the group of demonstrating youths. Yet this lady shares the intense passion to end the mandatory detention of Asylum Seekers with the Left, the Greens the Marxists and the Anarchists. Years earlier, refugees came by boat from Vietnam, today they are from Iraq, Iran and Afghanistan. They travel by boats that are overloaded and barely seaworthy from Indonesia to Australia, aided and organized by "people smugglers". For years now Australia is detaining people arriving without valid papers in detention centers. The facilities used to be partly open, but now they are high security prisons. Over 1200 People, including 101 children are incarcerated in five such jails. They are hoping to get a decision in their favour to be able to stay or are facing deportation. There are over 400 detainees held in camps in the Pacific island of Nauru and in Papua New Guinea. The Australian Government wants to protect the integrity of their policy of controlled migration with their own version of mandatory detention. It is a policy that is supposed to have created a harmonious and multicultural nation since 1945. Since 1996, when the conservative Prime Minister Howard was voted in as Prime Minister, this policy has not only led to intensified detention of Asylum Seekers, but has become a politicised issue. Observers agree that the hard stance of the Howard Government has ensured his victory. Critics accuse the Prime Minister of consciously activating dormant racism and fear and hate of foreigners in the community. "He makes the Australian population believe that they are correct in fearing that a handful of refugees will endanger their life style", says writer Thomas Keneally, author of the book that became the blueprint for Stephen Spielberg's "Schindlers List". After the terror attacks of September 11 in 2001, the attitudes became more extreme. Without any proof, the government drew parallels between the Muslim refugees and the extreme Islamic terrorists. The Prime Minister suggested that the Asylum Seekers were criminals that had jumped queues made up of legal refugees. His opponents say, that this is not true and that according to article 14 of the declaration of human rights, every human being has the right to ask for asylum in another country. The problem with refugees arriving in Australia is small compared to Europe. Between July 2000 and June 2001 a total of 4137 people arrived in Australia by sea without the necessary papers. Another 1508 arrived by plane. According to practices of the past, most of them will eventually be recognized as genuine refugees -- approved very quietly. Betty Dixon is bending over to tie her shoe. She defends Australia's right to protect its borders and regulate immigration, as do many other activists. Her criticism is directed towards the treatment of the so-called illegals. "I'm ashamed for my country. We are so rich and we are turning our backs on these people", she says. In August 2001, the Norwegian freighter Tampa was prevented from taking 433 shipwrecked refugees from Afghanistan to Christmas Island situated in Australian territory. Heavily armed soldiers stormed the ship to guard the weak and frail refugees, including sick women and children. The Afghani refugees, fleeing from the Taliban regime, spent days in the burning sun and were finally deported to a camp in Nauru. The Australian Government paid the tiny bankrupt nation for this generously. Howard calls this passing of responsibility the "Pacific Solution". He said that this solution would put an end to the activities of "people smugglers". His popularity that had declined considerably before the Tampa crisis, shot up and he was re-elected. Since then, Australia has created a shield in its territorial waters to the North against this expression of human suffering. The navy patrols the area between Australia and Indonesia, and several islands have been excluded from immigration laws. Anyone arriving on these islands without valid papers is not able to apply for asylum. Australia can force the refugees to turn back, which involves a long and dangerous journey. This cruel policy is showing success. For 20 months, no new refugee boat has arrived in Australia. Last week, a boat loaded with 53 people had entered Australian waters. "May they drown" said a passer-by at the local shopping center, after Betty Dixon raised the issue of asylum seekers at an information booth for humanitarian aid. "Some people have an enormous feeling of hate inside them", Betty said, "it is also directed towards me". A few hundred meters away, the Baxter Detention Center is baking in the hot sun. It is surrounded by a security system that would put most high security prisons to shame. 6m high metal fences surround the facility, with one of the fences being electrified. A "death zone" exists between the outer and the inner fences, which keep the main camp area separated from the outside world. From there it is another few hundred meters to the area where several hundred men, women and children are housed. The Australian population today is 19.4 Million. Over the last 50 years, Australia has welcomed not less than 6 million migrants, including 600000 refugees. Australia got known in Asia as a country that defended human rights. But this is no longer so. Keeping children and "illegals" indefinitely is against the declaration of human rights by the United Nations. Activists and humanitarian organizations are continuously raising the issues of the inhuman treatment of detainees. They report unjustified punishments, physical and emotional abuse and that the medical support available is insufficient. So far, the camps have been administered by Australasian Correctional Management (ACM), a privately run American company that runs prisons for profit. A university study has come to the conclusion that almost every child held in detention for more than 2 years will have "multiple psychological disturbances". They enter the detention centers as normal children, but have to witness suicide attempts, self-mutilations and acts of violence. Many have tried to harm themselves. Activists are accusing the Department of Immigration of actively prolonging the processing of asylum claims. A few unsuccessful Asylum Seekers have been living in the camps for years. The Australian Government is rejecting any such criticism. The Immigration Minister Philip Ruddock laments with a monotonous voice that it is only due to the fact that people who have been rejected have access to a legal system that may take many months to consider their appeals. He is the top executor of the asylum politics and policies. Once upon a time he was known as progressive, but he has become one of Howard's hardliners. He rejects the claims of cruelty as false propaganda or simply passes responsibility for misconduct to ACM. Independent reports about what is happening behind the razor wire rarely reach the outside. The state- run TV channel ABC showed secretly filmed footage of detainees being on a hunger strike with their lips sewn together, and detainees throwing themselves onto the razor wire in desperation. Despite this exposure, a poll revealed that the majority of Australians support the system of mandatory detention. What counts for Betty is what she has found out about jailed detainees in Baxter. The woman says "once you hear their stories, you won't be able to get away from it". She exchanges letters with dozens of detainees from Afghanistan, Iran and Iraq. They are Engineers, Computer experts, Cooks. She affectionately calls the younger men "my boys". "Their only crime was to search for freedom for their families". Betty Dixon will be known to many RAC supporters- she was the grandmother of activists and a life long human rights campaigner. Betty was part of RAC and we acknowledge the inspiration she was and the great work she did for asylum seekers and refugees. The following tribute was written by Pamela Curr. "Sad news today 14 June, -- Betty Dixon died early today in Canberra. Betty was a veteran activist in the refugee movement. She was mother, grandmother, friend , comfort and mentor to many asylum seekers in Port Hedland, Woomera, Baxter and Villawood, visiting regularly. Our Betty was 76 years old. Betty was an indefatigable writer of letters advocating on behalf of her "boys". Politicians knew her only too well from her many phone calls to their offices seeking justice and freedom for the many asylum seekers she befriended. Betty was mother to 5 children and numerous grandchildren who were with her these last weeks. She campaigned against the war in Iraq and was an anti-uranium activist. Betty went to the Baxter and Woomera protests in support of refugees. No place was too hot, dusty or uncomfortable. She is an inspiring woman, small in stature and big of heart. Her background in nursing meant that she was practical in a crisis offering practical and financial help as well as moral support to the many refugees who spent their first weeks out in Betty's house learning their way in Australia. Christmas holidays with family, children and dogs were open house to refugees as well. Always ready with a laugh, a smile and helping hand, Betty will not be forgotten by the many who loved her. We extend our sympathy to her family and thank them for sharing her with us in the dark days of Howard's war on refugees. Betty could have had a comfortable life with her many interests and friends but instead like many in the refugee movement, she devoted her time to overcoming these cruel policies. She really was an inspiration. We all miss you already Betty. Valé dear friend." Refugee activist Betty Dixon died on June 15, aged 76. She made numerous trips to Woomera and Baxter detention centres to visit asylum seekers, and frequently visited the Villawood detention centre in Sydney, three hours' drive from her home in Goulburn. Betty's activism began in 2001 with the demonisation of the Tampa refugees, which she said "really got me going". She set up a Goulburn group of Rural Australians for Refugees, getting her children involved as well. Betty subscribed to Green Left Weekly for many years and arranged subscriptions for some of the asylum seekers she befriended in detention. She called these young men her "boys". Many of them called her "Mum". One of these, a young Iraqi refugee, was released from Port Hedland detention centre after six years. He was welcomed into her home as a son. She wrote to me in March 2005, saying, "Although he seems relaxed and confident and will not see a counsellor, the anger and hurt is still there. He spoils me rotten -- cooks, cleans, shops and gardens. We will never really know the damage that we have done to these people." While Betty drew inspiration from the young people involved in the refugee-rights movement, I think I speak for many of us who've been involved in the campaign in recent years when I say that Betty represented much of what is inspiring about this movement. Refugee advocate Pamela Curr wrote: "Betty could have had a comfortable life with her many interests and friends but instead, like many in the refugee movement, she devoted her time to overcoming these cruel policies. She really was an inspiration. We all miss you already Betty. Vale dear friend." Betty requested no flowers but donations to Green Left Weekly or Palliative Care Services would be appreciated. Sad news today - Betty Dixon died early today in Canberra. Betty was a veteran activist in the refugee movement. She was mother, grandmother, friend , comfort and mentor to many asylum seekers in Port Hedland, Woomera, Baxter and Villawood, visiting regularly. Our Betty was 76 years old. Betty could have had a comfortable life with her many interests and friends but instead like many in the refugee movement, she devoted her time to overcoming these cruel policies. She really was an inspiration. We all miss you already Betty. Vale dear friend. This is indeed sad news, for me as well. I met Betty on several occasions, ad we had many goodhearted laughs together about the abysmal manipulations by politicians and the "tricks of the trade" of independent advocates in this context. Thanks to Pamela for wording this message so well. And - for the record - Betty's "pilgrimage" story to Woomera-2002 and Baxter-2003 became probably the first ever personal story by an Australian refugee advocate to be printed in a German newspaper. Vale Betty - may your pleasure in doing good things surround you.